Love seems like magic sometimes. Try to grasp it and it disappears, but you can find it right within reach when you least expect it. This framed print from Zlatka Paneva captures some of the mysterious enchantment of romance. Evoking the style of vintage engravings, the silhouetted hand holds a brilliant red heart—but gently, delicately, as if at any moment it might slip away. Paneva's artwork is a combination of reality and imagination. Her prints demonstrate surrealist and pop art influences that draw you in, evoking stories in the viewer's imagination. Made in Los Angeles. 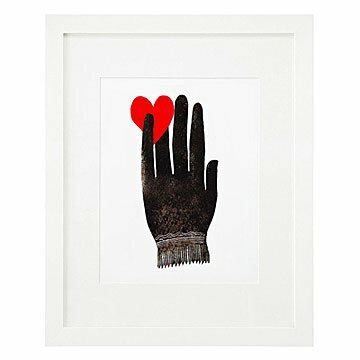 This framed art print evokes the style of vintage engravings, with a silhouetted hand gently holding a brilliant red heart.